Behind the counter at Middlebury Chocolates, dark nibs from a batch of Tanzanian cocoa beans churn slowly in a refiner. The small contraption, which looks like a cross between an ice cream maker and a deep-basined mortar and pestle, keeps the cocoa solids and sugar crystals warm and gently spinning. Over three days, they'll gradually break down, and the coarse, creamed-butter texture will turn into a soft liquid. 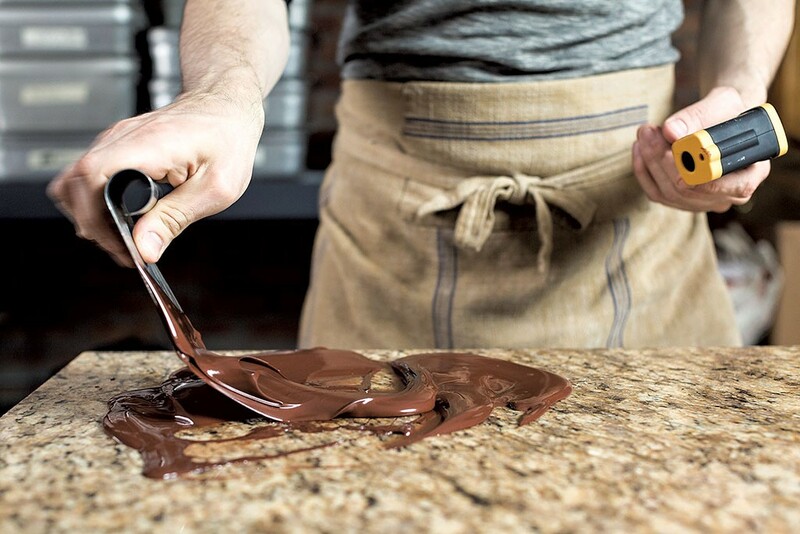 Stephanie Jackson, who co-owns Middlebury Chocolates with her husband, Andy, dips a spoon into the center of the refining bowl and observes the chocolate's texture as it slides, glossy and thick, off the end. "Once you start roasting and grinding your own cocoa beans, and you smell that aroma and taste that flavor," says Andy, "you can't really go back." In fact, producing small-batch, bean-to-bar chocolate has only propelled the Jacksons forward. 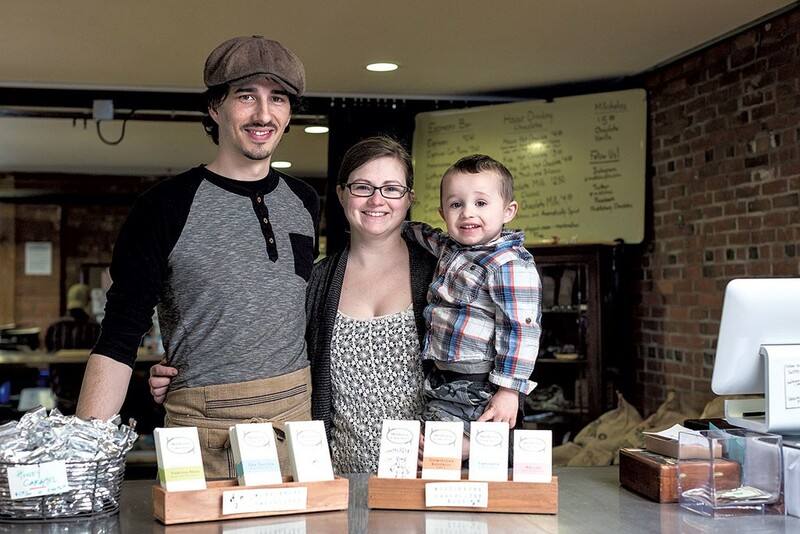 When the couple moved to Vermont from Asheville, N.C., with their two children, Azrael and Aria, they had no plan to become artisan chocolate makers. At the time, Andy was a freelance photographer and Stephanie was a stay-at-home mom who picked up various projects in sound mixing and audio engineering. "But we always loved food," Stephanie says. "We loved being creative and, more than our other creative outlets, food was the most instant gratification." Andy agrees, adding that Vermont's ethos of local food was a draw for moving to the state. He also has roots here; his mother grew up on a dairy farm in Johnson. During one family visit, he and Stephanie stopped in Middlebury to walk around and see the town. That same day, they fell in love with a house for sale near Court Street, and their desire to relocate solidified. "We were looking for somewhere different to raise our children, and we found that house in Middlebury," says Stephanie. "Vermont's a special place ... It's a good way of life." So the family packed up a U-Haul trailer in Asheville and arrived on January 1, 2010, in Middlebury. They were greeted by a blizzard and two feet of snow. Six years later, Stephanie, 33, and Andy, 32, are making micro-batches of high-quality chocolate at the back of their spacious coffee shop overlooking Otter Creek. They've also made an addition to the family: Malachi, now 2, who most days plays in the café or hangs out with his parents behind the counter as they work. This family-friendly business was "all an accident," says Andy — a result of Stephanie's "hobby of making chocolate confections." And it happened soon after the Jacksons arrived in town. As thanks for showing them around town, Stephanie made dark-chocolate truffles for a local resident. After sampling them, his immediate reaction was, "You should sell this stuff!" It was just the encouragement Stephanie needed; scarcely a month later, Middlebury Chocolates was born. They began by making specialty bars, confections and truffles at home, selling them wholesale on their website and at the local coffee shop, Carol's Hungry Mind Café. Stephanie and Andy were chocolatiers, but they were not yet chocolate makers. She notes the difference: A chocolatier creates confections from purchased chocolate, while a chocolate maker creates the chocolate itself. When the couple tired of the inconsistent quality they found among chocolate suppliers, they decided to buy some cocoa beans and try making their own. "We got a tabletop grinder and just started experimenting," recalls Stephanie. "That's when things really started to grow. We had our first bars on the shelf by September." The Jacksons soon outpaced at-home production. They worked for about a year in a commercial kitchen off Route 7, but "the location was terrible," Andy says. Then they met Jen Roberts and Judd Markowski of Daily Chocolate in Vergennes and gladly took them up on the offer to share some of their kitchen space. They continued to sell wholesale, online, and through various local businesses and co-ops — and to search for a place of their own. "There were dreams and ideals, but no plans," said Stephanie. "I always wanted to own a coffee shop that sold chocolates as well. That's what we were going for. We were waiting to find somewhere perfect." When the space opened up in Frog Hollow Alley, with a terrace next to the Middlebury waterfall, the Jacksons jumped at the opportunity. Middlebury Chocolates soon materialized with a café in the front and chocolate making in the back. Stephanie explains their process like this: "A bean-to-bar maker is someone who takes dried cocoa beans, turns them into chocolate and produces an end product of chocolate bars as their primary product. At its core, bean-to-bar implies a keen and intimate knowledge of every ingredient involved in the making of the chocolate, from the farm to the final shelf product." The cocoa fruit is an orb-like pod filled with "wet" cocoa, which looks more like a bowl of cannellini beans than anything related to a chocolate bar. Once the pod is split open, the beans begin to dry and ferment. The flavor concentrates, and the beans become more easily digestible. The Jacksons source their heirloom cocoa beans — all are either organic or certified by the Rainforest Alliance — directly from cocoa farmers and cooperatives from countries including Nicaragua, Tanzania, Venezuela, Belize and — most recently — Vietnam. "Chocolate is not just a flavor, it's a food," Andy says. "It changes with the season; it changes with the process. There are so many changes of hand that the product should never taste the same." He also notes that the complexity of chocolate goes beyond "milk" and "dark." It has aroma and tannins, like a good glass of wine; it's a tasting experience that can be as cerebral as it is physical. Andy shells a few dried cocoa beans from Tanzania and samples the nibs on the inside. He nods, describing the flavor: floral and smooth, with undertones of vanilla. "When roasted," Andy says, "the Tanzanian nibs take on warmer flavors like coffee, toffee or apricot jam. You can train your palate to pick up these nuances of flavor." With equal parts fascination and enjoyment, he continues sampling and describing different tasting notes. To Andy, beans from Belize have a traditional cocoa flavor — think Oreo cookies — but with an underlying dynamism that plays on the tannins of the nibs: lemon peel, lychee and a hit of something stronger, like alcohol. Nicaraguan beans are smooth and malty, with a high butterfat content that melts easily on the tongue. Vietnamese beans have cinnamon notes, while Venezuelan beans taste of biscuits and heavy cream. The process of chocolate making at Middlebury Chocolates requires as much concentration on technique as taste. First, the beans are roasted and spread out on a cooling rack. The cooled beans are then poured into a winnowing system that cracks the shells to release the cocoa nibs inside. The resulting batch of nibs is then hand-sorted and placed in the refiner. There the nibs stay, churning into a melted, silky liquid, for two to three days. There are no emulsifiers, corn syrups, additives or stabilizers. The chocolate is then filtered and poured into a deep metal pan to rest for 10 to 12 days, which allows the flavors to settle and develop. Eventually, the blocks are remelted and tempered on a granite slab. At last, it is ready to be turned into the bars and truffles that customers see on the café's long wooden countertop. This process is repeated five to six times per 154-pound bag of cocoa beans. The personal attention behind this micro-batch production seems to permeate the entire shop. Along with the chocolates, the Jacksons make almost everything in-house: the dark hot chocolate topped with local cream that's whipped by hand; thick marshmallows; the ice cream used in milkshakes; vanilla extract used in truffles. 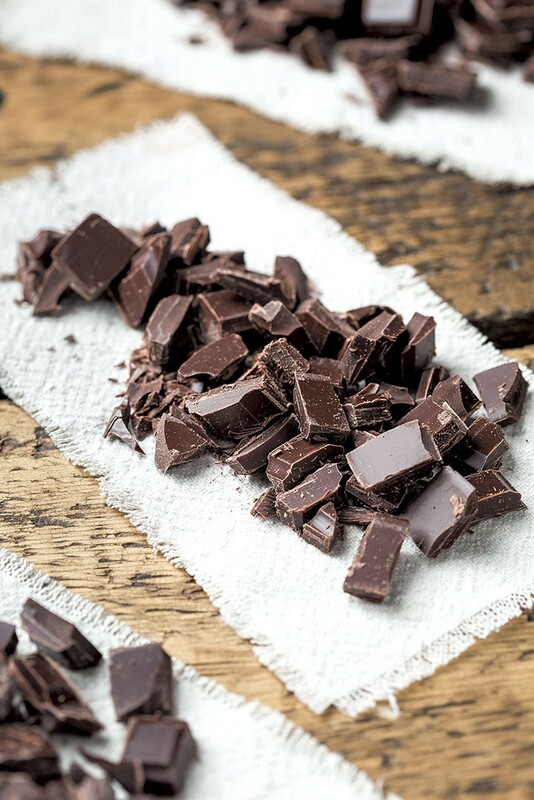 Andy also makes cocoa butter from extra nibs and cocoa husks that would have otherwise gone to waste, ensuring that the chocolate bars, such as the 75 percent dark Tanzania and the 80 percent dark Belize, are truly single origin. The fillings for Stephanie's rotating assortment of chocolate truffles — salted honey caramel, vanilla-cardamom, apple cider, peppermint — are original recipes with a simple list of unrefined ingredients. Even the white packaging is wrapped, labeled and dated by hand. "We work between 70 and 80 hours a week," Andy says. "It's 10 times harder than anything I've ever done, but also 10 times more fulfilling. We love making chocolate. We love making coffee. We love that we can have our family here." It shows. The Jacksons are calm, methodical and quick to smile, conveying a relaxed attitude that makes Middlebury Chocolates an oasis for local patrons. 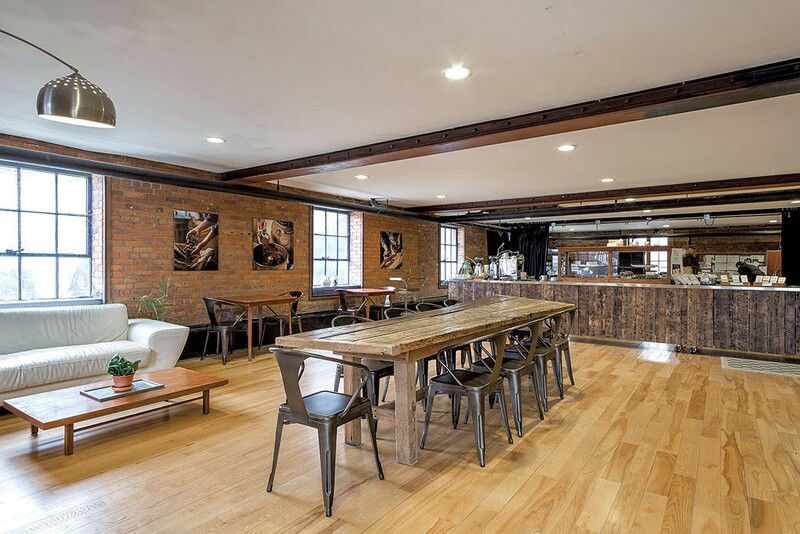 The café is filled with light and warmed by exposed brick and hardwood floors. Some tables have river views. There's a plush couch and armchairs and an old jukebox in the corner. It's common to find the Jackson children hanging out around the shop, as well. "They love to have friends come in; they love to help," says Stephanie. "They really want to be here." And they even inspired the couple's first business goal: to make flavorful, high-quality chocolate that they actually want their kids to eat. The original print version of this article was headlined "Raising the Bar"